Sure, homebrewers make the wort, but it’s yeast that makes the beer. The process of converting wort into beer is a labor-intensive task for yeast, and it deserves all the help it can get to conduct a quick but clean fermentation. 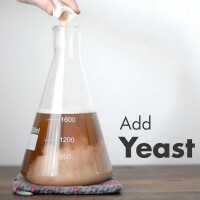 One of the best ways to ensure yeast is empowered for the best fermentation is by creating a yeast starter. A standard package of liquid yeast typically contains about 100 billion viable yeast cells. Sounds like a lot, right? Well, that’s actually only enough yeast for a 5-gallon batch of 1.048 original gravity homebrew. As volumes, gravity or both increase, more yeast is needed. On top of that, the number of viable yeast cells in a package decreases overtime. So, if you are planning on brewing larger volumes, higher gravities or using older yeast packets, it’s wise to pursue a yeast starter to ensure you have enough healthy brewer’s yeast to get conduct quality fermentation. Dry yeast doesn’t need a starter. Simply take the appropriate steps to rehydrate dry yeast prior to pitching. 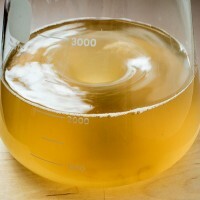 When making a yeast starter, you’re essentially boiling and fermenting a mini batch of beer. First you’ll need a vessel large enough to hold the volume of the starter and something to cover the top, like foil or a stopper. The vessel can simply be a jar or plastic bottle, but Erlenmeyer flasks that can withstand direct heat are a popular choice since the entire boiling and fermentation process can be done in one vessel. If not using a flask, you’ll need a pot to boil a small quantity of wort. Other than that, you’ll need some water, dry malt extract and sanitizer. 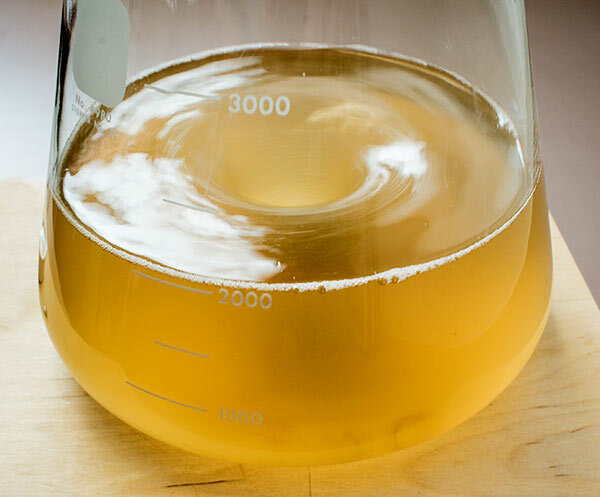 A stir plate, which can easily be made at home, is highly recommended to continually add oxygen to the starter, which is crucial in growing the yeast cell population in a starter. If a stirplate is not available, simply giving the vessel a shake every now and again is better than not adding oxygen at all. Gravity: Aim to have the gravity in the 1.030-1.040 range, which will promote healthy growth without introducing too much unneeded stress. Temperature: In general, aim to keep yeast starters around 72°F (22°C), with ales being able to be a few degrees warmer and lagers a few degrees cooler. Volume: Determining volume can be a very involved process. The volume of the starter in relation to the number of viable yeast cells added, termed the inoculation rate, will determine the growth potential for the yeast starter. For example, 200 billion yeast cells added to a 2 liter starter will have significantly less overall growth than adding 100 billion yeast cells to the same volume. There are charts, like the one in Yeast: A Practical Guide to Beer Fermentation, that can help make informed decisions. However, you may prefer to use a program like the Mr. Malty Pitch Rate Calculator, which not only helps determine volume, but also the target number of yeast cells based on your beer’s volume and original gravity. Determine the appropriate starter volume to achieve the target number of viable yeast cells for your beer. Remember, you can use an online yeast calculator like the one linked above to quickly determine these variables. Weigh out 1 gram of dry malt extract for every 10 milliliters of target starter volume. Add the dry malt extract to the vessel you will be boiling in. Add enough water to the boil vessel (dry malt already added) to reach the target starter volume. Add about 1/4 teaspoon of yeast nutrient to the boil vessel. You can use slight less for starters under 1-2 L and slightly more for ones larger. Bring to a gentle boil for about 15 minutes. Keep the boil vessel covered to maintain as much of the volume as possible. After 15 minutes, allow the wort to cool. If needed, transfer the liquid to the vessel that will hold the starter. (Note: As with beer, anything that comes into contact with the starter wort post-boil should be properly clean and sanitized). Pitch yeast into the chilled starter wort. Use a stir plate or intermittent shaking to add vital oxygen to the starter. Pitch into beer once ready! Starters are typically either pitched during high krausen or after active fermentation has subsided. Pitching at high krausen, or at the height of the fermentation’s activity, which typically is 12-18 hours after pitching the yeast into the starter is the most convenient method. Simply pitch the entire contents of the starter into the wort of your homebrew once it’s ready. Be sure the temperature is within 5-15°F of the wort’s temperature when using this method. If it’s too hot or too cold, it can shock the yeast and ultimately create problem fermentations. Warm starters or starters with volumes more than 5% of the main batch volume need additional preparation. First, allow the fermentation to basically complete and then chill the starter by placing it in the fridge until it is near the temperature of the wort it is intended for. Decant the liquid and pitch only the yeast cake. That’s it! You just pitched the perfect amount of yeast in your homebrew. Sources: Yeast: A Practical Guide to Fermentation by Chris White & Jamil Zainasheff; How to Brew by John Palmer. 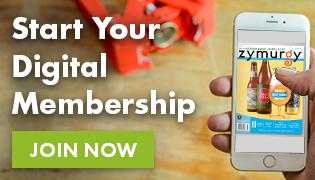 Do You Make Yeast Starters?